※A consultant and a training organization need a loyalty contract. ※You can copy and use contents of this manual. This is the facilitator's manual of Exercise “Mt.Bottle Gourd”(English version). All the know-how for managing Exercise “Mt.Bottle Gourd” is mentioned in this manual. Mt.Bottle Gourd”is a learning activitie for human skill development and global edcation. 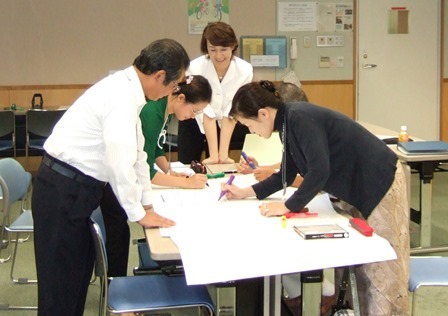 This training program is designed to get group members to bring fragmentary information together and sort and organize it in order to solve a given task. During this training, communication and leadership among the group members will become so active that energy, concentration and comprehension as a group will be enhanced.Each of the members may also be so active in participating in the training such that he or she will often intensify his or her concentration through the desire to solve the problem and comprehend other members with the aim of solving the problem. 最適人数は、1グループにつき6名。4名から8名まで可能。(Optimum group size is 6 for one team. Minimum of 4 people～Maximum of 8. 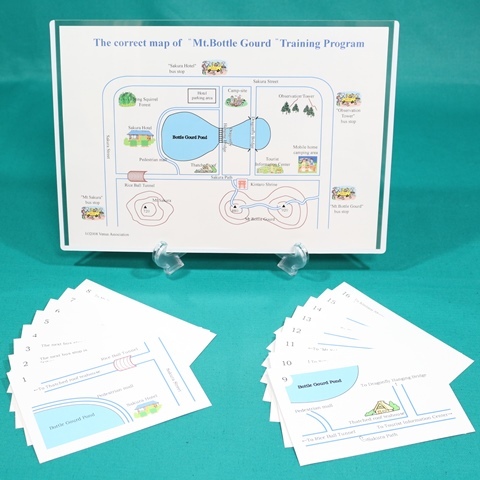 ・実習「ひょうたん山情報カード」　Information card set for exercise "Mt.Bottle Gourd"
・正解の地図　The correct map of Exercise "Mt.Bottle Gourd"
Information Card Set for Exercise"Mt.Bottle Gourd"
実習「ひょうたん山」カードセット　Information Card Set for Exercise"Mt.Bottle Gourd"
※Information cards which are written on this manual are not color (monochrome).You can make cards by copying Information card set for exercise "Mt.Bottle Gourd" in this manual, but optional "Information Card Set" is postcard size, and color, you can manage training more effectively.